Inder Loves Folk Art: Choo choo. Joe is currently obsessed with trains. Especially Thomas the Tank Engine and friends. So I decided to appliqué a train on my next Tee for Two raglan t-shirt. 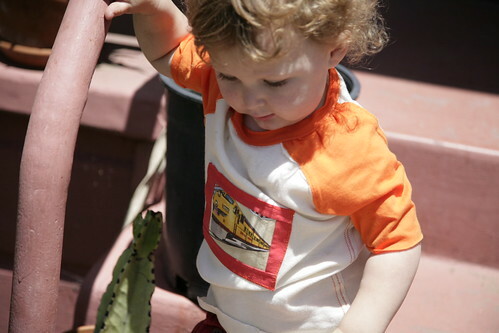 The problem is, he liked the appliqué so much (from a travel themed fabric that has been sitting in my stash for years now) that he wanted to carry the shirt around saying "choo choo" and he didn't want to actually wear it. I finally wrangled him into it, but he kept signing for "help" to take it off so that he could go back to carrying it around. Due to these rather complex objections, I couldn't get him to pose for a straight-on shot where you could see the whole shirt, but he was happy to show me his new "choo choo" set with tracks. I made myself a skirt this weekend too. 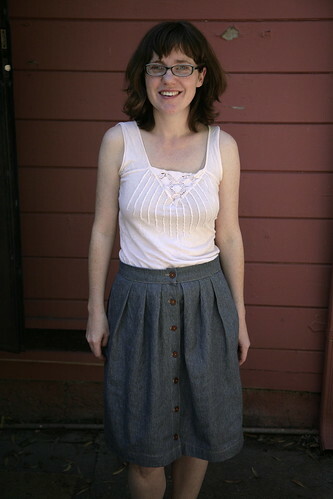 This is the "Helena Skirt," which is a free pattern download from BurdaStyle. It's a very simple style - a high-waisted, button-down skirt with pleats. I love the way this turned out. Easy and very wearable. I used a textured denim that might even pass for "business casual" (i.e., not limited to casual fridays). I took my cardigan off for a whole hour! I added some in-seam pockets in a contrasting fabric. I like my skirts to have pockets. I like to have some place to put my BART card. I totally winged it with these pockets, using a pocket piece from another pattern, and all I can say is, I'm never going to make another skirt without pockets again. Piece. Of. Cake. Yes, that's a bandage on my finger. Be careful chopping onions. Yes, we've had some shorts/summer skirt weather, finally. I'm afraid to jinx it, but actually, the weather has been gorgeous these past couple weeks - much warmer than our usual foggy June fare. We've been soaking up every ray of sunshine we can, and so have our plants. What is it with the trains?!?!? Miles is waaay into trains too, and we don't even own a single one! That shirt is awesome. Can you explain to a nonsewer like me what exactly is involved in doing applique? (Miles just walked up to me signing "train," by the way, with apparently no provocation.) Anyway, Joe is super cute, the shirt plus pants just kills me, and your skirt looks great on you. Super lovely, especially those pockets. I didn't get a detail shot of the shirt, where you could see that I had just "framed" the train piece in some strips of red cotton, folded under the raw edges, and zig-zag stitched in place. There is actually another step - there is a double-sided sticky iron-on "web" that you can buy to hold the applique in place while you zig-zag around it. So that's how I did it. Easy-peasy. Melissa, here's a simple tutorial on very basic machine applique so that you can get a visual of what I'm talking about. I basically made a patchwork square with a frame (because the train square had a cream background and I thought it needed more contrast with the day-glo sleeves), and then the rest just like the square here. I have done a couple of t-shirt appliques using just the fusible double sided stuff, then doing a big fat pretty running stitch in embroidery thread near the edge (by hand), and letting the raw edges fray a bit in the wash. I quite like the rough look of it. I won't take credit for the idea though... it came from a pack of iron-ons that I bought. Such a cute skirt and I definitely agree with you - pockets on a skirt are a must! i am catching up with your blog and i LOVE this skirt. contrasting pockets are the best.